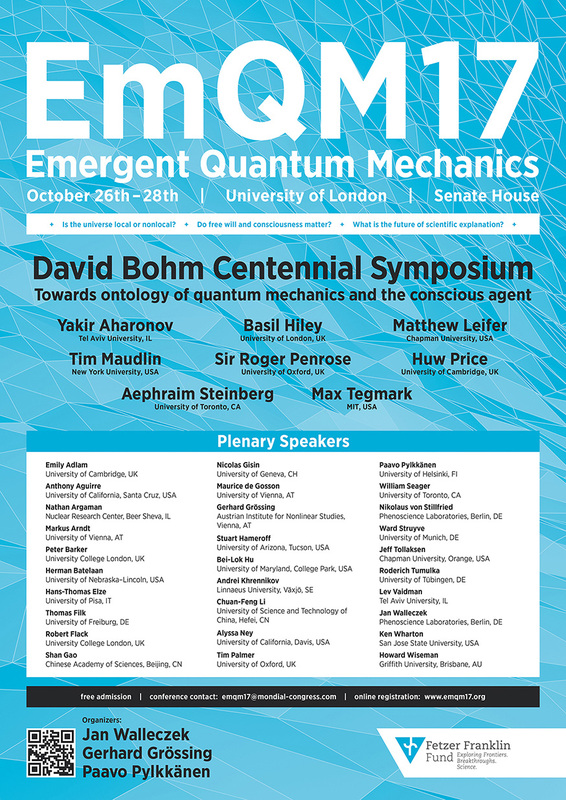 EmQM17: October 26th–28th 2017 | 4th International Symposium about Quantum Mechanics based on a "Deeper Level Theory"
July 30th: For the 32 articles in the Entropy special issue please click here. For the 32 articles in the Entropy special issue please click here. ● Are quantum ontologies possible or impossible in view of relativity theory? How to avoid the possibility of causal or information paradoxes? How to interpret the non-signalling theorem? ● Is the universe local or nonlocal? What is the nature of the connection between two distant measurement observations that manifest EPR-type nonlocal correlations? ● Are nonlocal connections – e.g., “action-at-a-distance” – merely a mathematical construct as in the orthodox view, or are they nonlocal causal elements in a radically new conception of reality, e.g., „quantum causality“? ● Does ontological quantum theory call for a new understanding of temporal relations at the quantum level, including temporally indefinite, time-symmetric, or retro-causal effects from the future? ● What new experiments might yield breakthroughs towards answering the question of whether or not ontological approaches to quantum mechanics could ever be validated? ● What is the role of the experimenter agent/scientific observer in realist quantum mechanics? Do free will and consciousness matter? What is the role of agency, e.g., the ability to access and control informational events? ● What is the future of scientific explanation? Is scientific metaphysics, e.g., the notions of causality, reality, and physical influence, obsolete in mathematical or informational accounts of the quantum world? ● Why quantum emergence? What distinguishes weak emergence, e.g., supervenience, from strong emergence? What is the ontological status of epistemically-inaccessible quantum states? ● What is David Bohm’s legacy for the future of quantum physics? What is his contribution to philosophy and to scientific views of reality characterized by monism and a relational ontology? On the occasion of David Bohm’s 100th birthday, these and related questions were addressed in search of a possible “deeper-level theory” for quantum mechanics that interconnects three fields of knowledge: emergence, the quantum, and information. The symposium offered an open forum for critically evaluating the prospects and significance – for 21st century physics – of ontological quantum mechanics, an approach which David Bohm helped pioneer. Contributions were invited that presented current advances in both standard as well as realist approaches to quantum mechanics, including new experiments, work in quantum foundations, and quantum philosophy. The symposium convened in Beveridge Hall at Senate House of the University of London. Senate House is located right next to Birkbeck College where David Bohm worked for several decades starting in the 1960s. 25 years ago to the day, at the time of the EmQM17 Symposium, David Bohm died on October 27, 1992. Lunch was served daily at MacMillan Hall at Senate House where poster sessions were also held during the three days of the symposium. Lunch was free for all registered symposium attendees, including registered participants, poster presenters, invited speakers, and special guests. A gala dinner was held after the conclusion of the symposium on the evening of October 28, 2017. 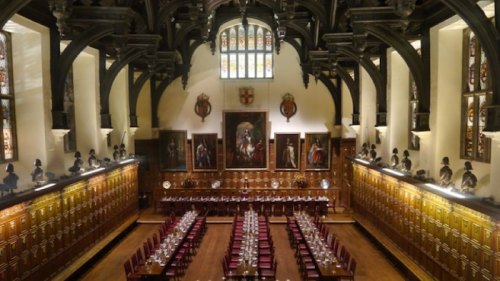 Dinner was served in the Hall of Middle Temple which is one of the finest examples of an Elizabethan hall in the country with a double hammer beam roof carved from the oak of Windsor Forest and an elaborately carved screen made in 1574. Attendance of the gala dinner was by invitation only and required the presentation of a special ticket.